"Glitter Is The Herpes Of The Art World"
...I'm not sure who originally said this, but like Herpes, glitter is certainly "the gift that keeps on giving"-it gets all over everything, and stays embedded no matter how much you try to get rid of it. It sticks to you, your significant other, your pets, your furniture. In fact, I don't even think comparing it to Herpes drives home the point of how much glitter pollutes....everything it gets near. "Glitter Has More Of A Half-Life Than Uranium!" What was once the sole domain of pre-teens and strippers, glitter is now a performance mainstay for all types of dancers...as well as gymnasts, cheerleaders and gals who like to sparkle on the dance floor during a night on the town. And now that the Holidays are upon us, glitter is EVERYWHERE. Glitter looks lovely under stage lights, it will highlight your every movement and make you look like a fairy dusted fantasy. It can be applied to the skin , and even on top of the stockings on your legs - or body stockings, if you wear them. There are many types of commercial body glitters available;they come in sprays, oils, and in little solid waxy bars as well as in the “sprinkle on” type. 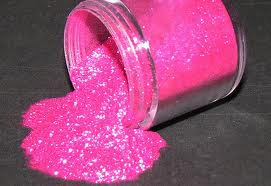 However, I prefer to make my own body glitter mix; it looks much better with my coloring, and it also saves money! On your face and especially around your eyes, you must wear cosmetic glitter. In the old days glitter was made of metal flakes. 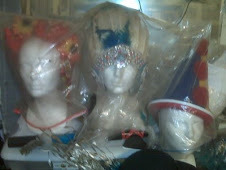 Now, glitter is usually made of some type of copolymer plastic. 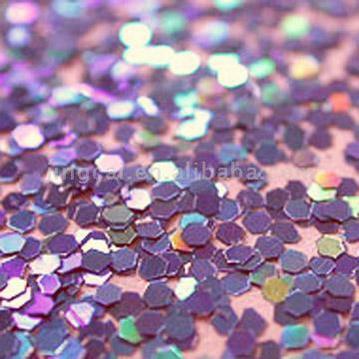 The individual cosmetic glitter flakes are laser cut, in shapes that are are oval and/or rounded, not square or octagonal the way most craft glitter is cut. When used on your face, this will reduce (but not prevent!) any injury, should the glitter get into your eyes. Also, some craft glitter is still made of metal. How do I know this? I am so glitter-obsessed that I actually have a friend who was a biology student at Berkeley look at many types of body glitter, craft glitter and cosmetic grade glitter under her microscope! I sent her lots of unlabeled glitter samples, and she told me what shape they were and what they were made of…it was extremely educational! But back to making your own body glitter and saving money by doing it- since you will not risk potential injury by using craft glitter on your body, there is no need for you to buy expensive, pre-made body glitter. Buy a few different colors of regular, inexpensive craft glitter, the kind in the big shakers, then mix them up in a jar and pop it into your gig bag, along with a small container of hand lotion or body cream. When you want to glitter up, just mix the two products in the palm of your hand and apply it liberally to your skin. For my own body glitter mix, since I am fair-skinned, I use equal parts of lavender, opalescent pink, iridescent white, gold and silver. If you have skin that is darker, you might want to also mix in shades of bronze, orange, opalescent yellow and copper. Deeper colors of glitter such as dark reds, purples, black, blues or greens tend to look ashy and strange onstage, so stick to a mix of shades that enhance your natural skin tone. Insane as this may sound, I also think glitter is a great exfoliant! When you wash it off in the shower, it totally helps to slough off any rough or dead skin cells. A word to the wise: though glitter looks great in motion ( such as in performance, on film or videotape) but in still photos, but it can appear gritty and make your skin look bumpy, unless you are photographed from very close up, so think about doing some promo shots without it, then adding on the sparkles... or just saving it for performances. Oh, and be prepared to sleep in a bed full of pixie dust, because that’s exactly what you’ll be doing post-show, even if you showered the moment you got home! I’ll say it one more time: do not use craft glitter on your face! Now get on out there and SPARKLE! "I am so glitter-obsessed that I actually have a friend who was a biology student at Berkeley look at many types of body glitter, craft glitter and cosmetic grade glitter under her microscope!" Ha! I totally remember that story... that was the time you had the "Sparklies" that I sell with you. They are awesome, oval, and polymer... and even better yet, the color is injected between the sheets of polymer so that it doesn't fade, scratch or wear off over time in the container. LOVE LOVE LOVE glitter!!! My mom sewed costumes for a dance studio and my poor brother got teased at school because he was always covered in glitter. In 4.5 billion years, the only things left on earth will be uranium, cockroaches, and glitter! I use gel instead of lotion- stays put better when working up a sweat. You do have to experiment a bit to find one that works for you, since some will flake off or look dried out, but most of the ones I've tried work well. Oh dear, now you've put me in a quandary. I never thought what the sparkles were made of before. I never use "exfoliant" shower gel because it's full of tiny polymer beads, which are (obviously) washed down the drain, and are so small they pass through all the treatment works and out into the ocean, where they're eaten by turtles and other sea life which mistake them for krill. Then they get stuck in their stomach and ultimately, kill them. I fear sparkles may come into the same category so looks like I'm not going to be sparkling on stage, except on my costume. So good article,I enjoy with this.Thanks for this nice post. FLASH DANCE: WHAT'S GOING ON UNDER THAT COSTUME? THE GIFT THAT KEEPS ON GIVING...YOU!